The Toughline platform is the foundation for most body options. Be assured our bodies rest on a solid foundation. Read through the specification list for this one and know your truck body is well supported. Accommodates 2” x 4” nominal lumber orour standard stakes. Optional: 4" 5.4# structural on 16" or 12"
Standard finish on platforms is black with decals. Other options or modifications available on request. The Structureline platform is built for rough service. Load it down and work it hard. The structural steel channel throughout will handle your toughest job. This Rancher Special is handsome but strong. It’s got guts. 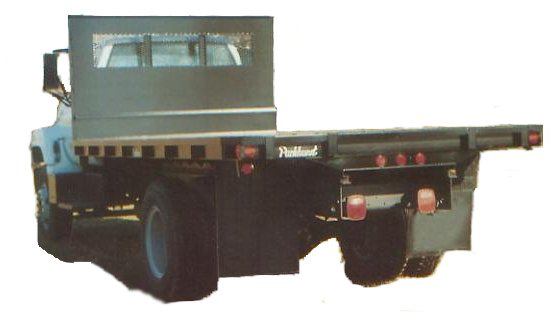 Example: The 9’4" body has 7 structural cross members plus a structural front rail covered and reinforced with floor plate. There is more. The rear rail/apron is formed 3/l6” plate 10 5/8” deep. See the specs on the receiver hitch. And the gooseneck hitch of 6” structural, 4” structural, ½” plate and 3/16” plate all tied together then welded into both the longsills and crossmembers. 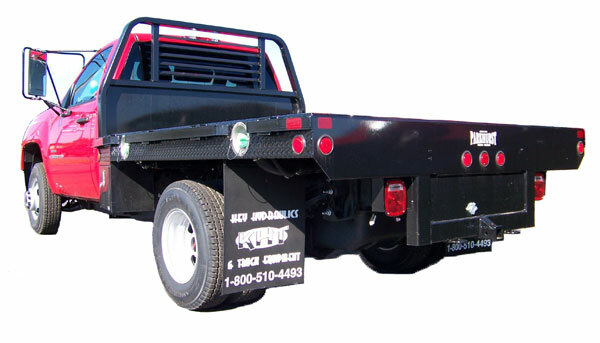 Recessed gooseneck hitch with safety chain loop standard. (ball not included) Atwood B-25 retractable ball assembly optional. safety chain loops; and tail light brackets. Standard finish for platforms in black. We took the very popular Rancher Special and added an electric hydraulic bale spike. This model will fast become your favorite piece of equipment. Simple, rugged design for trouble free service. 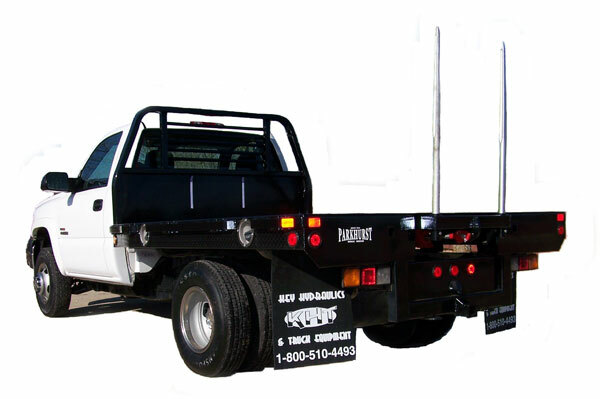 Quick removal of dual forged bale spikes allow easy access to body and gooseneck hitch. Heavy-duty hinge points and a heavy-duty 12-volt gear pump are standard. The Rancher Special Bale Spike Body includes recessed gooseneck hitch with trap door; a heavy-duty receiver hitch, 3" structural crossmembers and 6" longsills.